Air solution to improve the air quality in your home is by installing an exhaust fan. 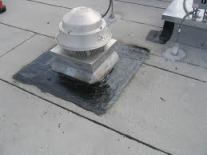 Exhaust fan roof vent devices help to draw out old and polluted air from the home and allow fresh air into the house. They are generally ducted to the outside of the home allowing the polluted indoor air to be removed from the indoor living space. Installing these fans in the home can help with allergies, asthma, nose bleeds,and several other health problems. They also help prevent mold and fungus from growing which can cause major health issues. There are several different types of exhaust fans that are available, the type that is used is dependent on where they are going to be mounted and the location where they will be installed. There are six different types of exhaust fans: ceiling, in-line, wall, combination, exterior remote mounted and kitchen range exhaust fans. Ceiling mounted fans are installed in the ceiling and draw the air our through the an external vent through roofing vent, In-line Exhaust fans are installed in between ducting, these types are used when you do not have the room to do a ceiling mounted fan. Wall mounted fans are installed to exterior walls of the home, they draw the impurities directly outside and no duct work is required for installation. Combination fans give you the option of either fan and light or you can have ventilating fan, light and heat all in one. The Exterior fans are installed outside your home and they will pull out the impure air instead of pushing it out, an advantage of this fan systems is that since it is installed outside the noise is not as bothersome. Lastly there are the Kitchen range fans, that are mounted inside the range hood for the stove, these help with getting odors out and can reduce moisture in the kitchen. Bathroom exhaust fans are of major importance since this is where the highest moisture and humidity levels are present at in the home. A brand that is out on the market, that provides a broad selection of products is Panasonic technology. They do provide a whole line of bathroom exhaust fans, but they are not limited to being used in the bathroom, some of them are able to ventilate multiple rooms or areas. The units come in different Air Volume (CFM) options so you are able to pick which one would better for you. The pricing on these units are anywhere from $130-$400 and they energy efficient. Exhaust fans are not explosion proof although they can be manufactured to be spark and explosion resistant.